In the mid-80s, thanks to the success of platforms like the C64 and MSX, video game machines that could double as personal computers were hot. So it's understandable that, ahead of Nintendo's entry into the North American console market, the company was thinking that its first US machine might need to be more than just a re-branded Famicom. This is the Nintendo Advanced Video System, a prototype unit that was only ever publicly displayed once - at the 1985 Consumer Electronics Show - and was never manufactured. It's not a variant of the Nintendo Entertainment System that gamers around the world would grow to love over the course of the 1980s; this was originally it, intended to be Nintendo's primary machine in the West. And what a machine it was. It was ridiculously ambitious, designed to accomodate external peripherals like electronic instruments, including accessories like a tape deck and keyboard and, most impressive of all, its controllers were wireless, operating via infa-red. We're not talking bulky add-ons or third-party accessories like the Satellite; we're talking the sleek, standard controller included with the console. As you can see in these promotional images, released in early 1985 by Nintendo (and uploaded by former Nintendo mascot and executive Howard Phillips), it wasn't just the capabilities of the AVS that were different. 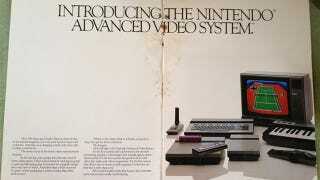 The design of the console and controllers differed from those of the NES as well. The unit itself was more squat and streamlined, while the controllers featured large shiny buttons (and, weirdly, a terribly d-pad). Sadly, as nice as it looked and as impressive its specs were, the AVS was ultimately scrapped for a number of reasons, from the wireless IR pad's poor performance to cost issues. In its place, Nintendo opted for the "lunchbox" NES that you'd be more familiar with, a console whose most extravagant features were that it had a plastic door. Following the AVS' debut in early 1985, the Nintendo Entertainment System was first revealed in June of that year, and would first go on sale in New York City in October 1985. Those curious about the AVS, it hasn't been entirely consigned to the dustbin of history. Visitors to the Nintendo World Store in New York City can see one on display upstairs in the "museum" area.